You are a better woman that me, no beads for me. They are really, really pretty. They look VEEERRY pretty in the picture! Well, it looks wonderful (and done!). I'm knitting with beads right now and wishing that I didn't love how they looked. Oh wow! That is really pretty! 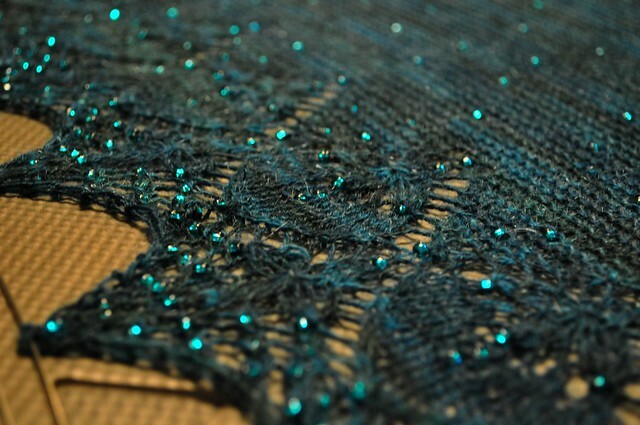 One day I will attempt beaded knitting... Love it! I feel your pain. I decided to add beads to a cowl, and it is really slowing me down. Those beads are perfect for that yarn, though. I'm sure you will get lots of compliments.